When we initially met with our clients, they expressed the need for modernization and updating. The original kitchen had good quality cabinetry but had standard finishes and lacked a little bit of design. 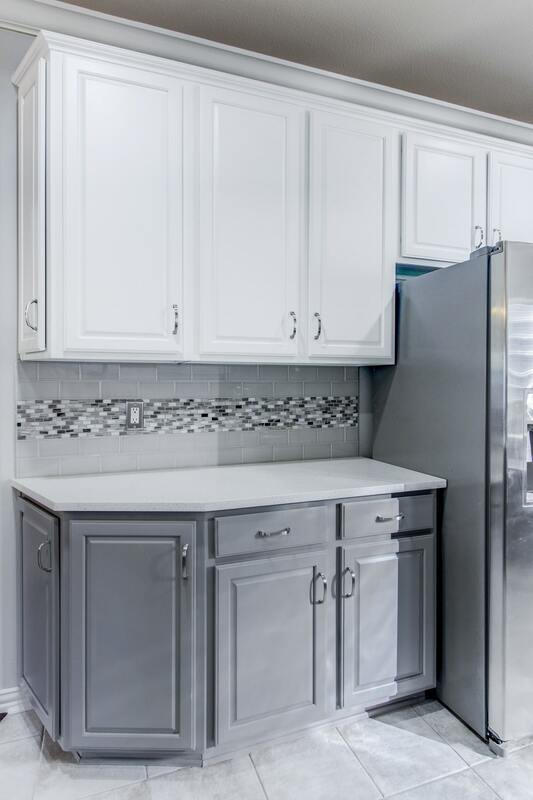 With utilizing this kitchen already good bones, and a “few” updates, it’s almost as if it’s a brand new kitchen! 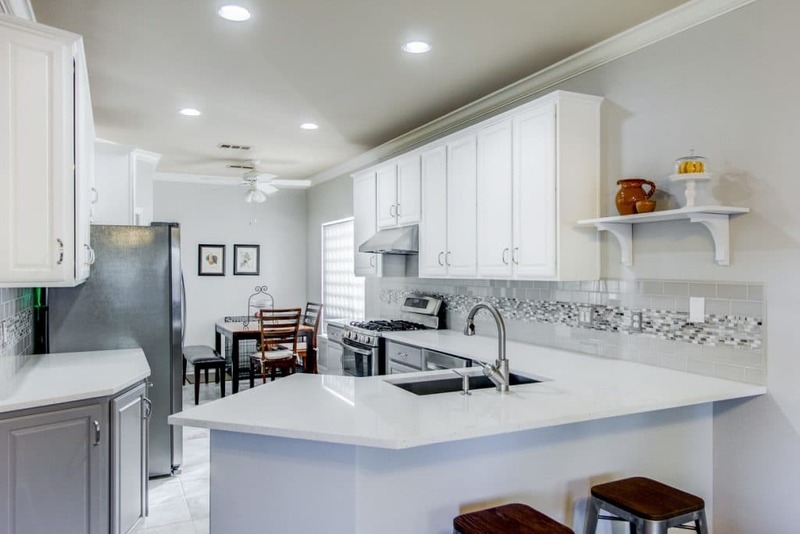 This included a fresh new finish for the cabinetry, new countertops, backsplash, and fixtures. 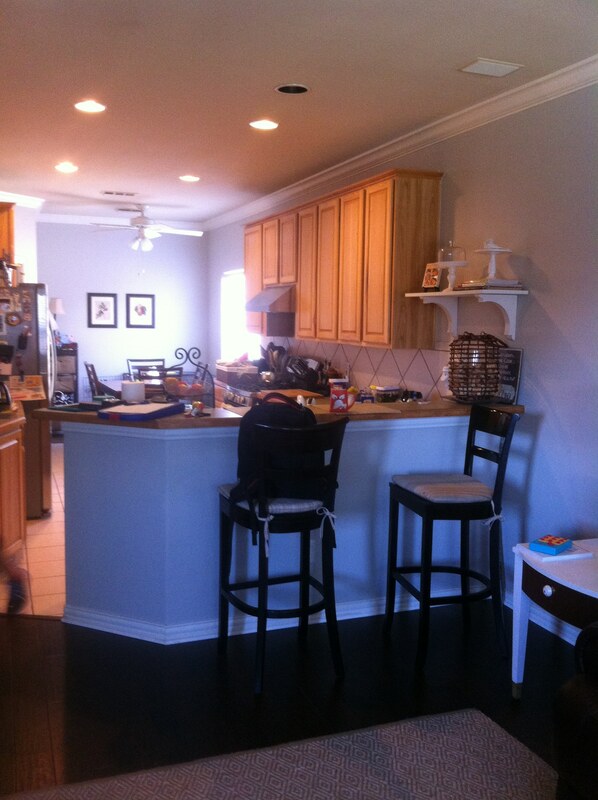 Want to learn more about how we transformed this kitchen? Continue reading below! As mentioned above, the kitchen already had great bones. Refinishing cabinetry is not only a great way to save money but a wonderful way to recycle and revamping what you already have. All, we needed to do was remove the door and drawer fronts, paint the cabinet boxes and paint the fronts. Voila! 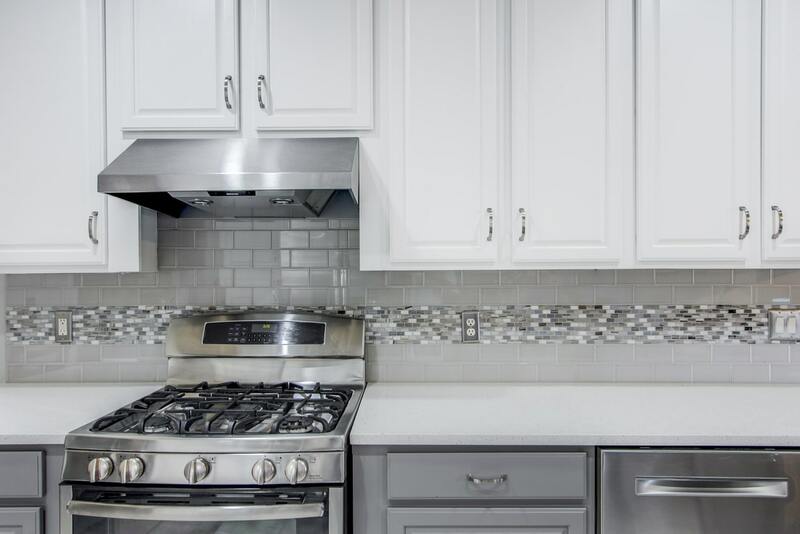 We have a two-tone white and grey kitchen! Already the space was looking fresh and brand new. However, no stopping there. While we were at it, we updated some other stuff as well. Keep reading below! Having lived with laminate tops for a while, our clients were starting to notice the wear and tear from its daily use. So, they wanted something that would not only last but also is easy to maintain. There’s no better choice than quartz! They decided on a 3cm Caesarstone in Nougat – a great pairing with newly finished cabinetry! 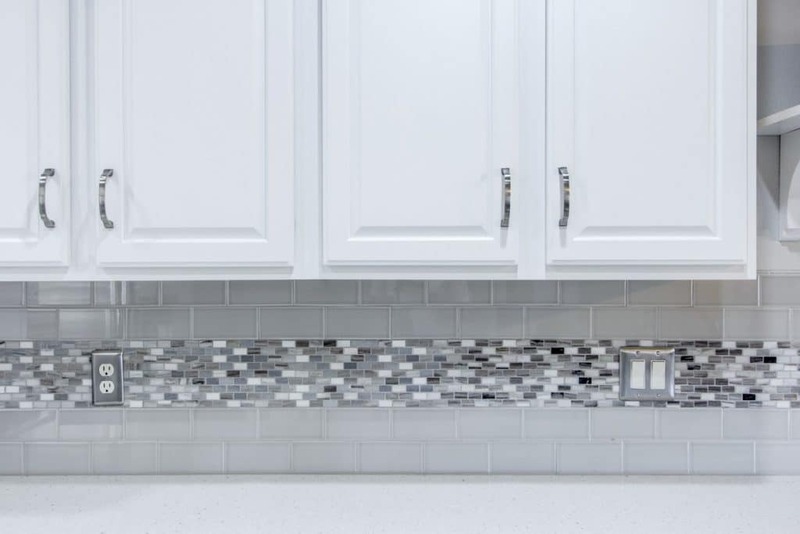 Having had 12×12 standard tiles as the backsplash, there were lots left to be desired. With tons of options of tile out there, we decided on utilizing two different tile styles as the backsplash. For the main field tile, we have a 3×6 H-line in Pumice, and an accent tile in Daltile Frost Snow marble. Simple, classic, and clean! Lastly, the finishing touches of the kitchen, are not just finishing touches. They provide functionality to the space! The sink and faucet are not only beautiful pieces but something you use every single day, so they must be something that works for our client’s space. Our clients decided on a Blanco Quattrus super single bowl in stainless steel, and a Blanco faucet and soap dispenser.